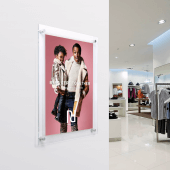 This style of poster frame is ideal for a variety of industries including retailers, estate agents, hotels, spas, restaurants and many more. The simplistic design is complemented by the simple installation, with all fixings supplied. How do I change my poster? It's easy to change a poster over, just unscrew each of the wall mount screws which feature at the front. 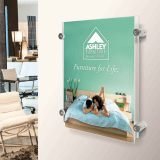 Once you have unscrewed each one, the front panel will then simply come off, allowing you to take the poster out and install a new one. You can apply a vinyl graphic to the back panel if you wish. 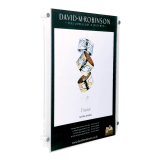 Each poster frame comes complete with two acrylic panels and the correct number of wall mount fixings for the poster size. Fast delivery well packaged great value. V pleased. These are really effective, simple to fit and use, display frames with a nice contemporary look. Nice and shiny and well finished. Good customer service, exceptionally fast delivery.